Miley Cyrus’s boyfriend, Liam Hemsworth, opened the door to the pop singer’s heart – literally. There were some early stumbling blocks, admitted Cyrus, who said she was taking a hiatus from dating when she met the Australian actor, 19. 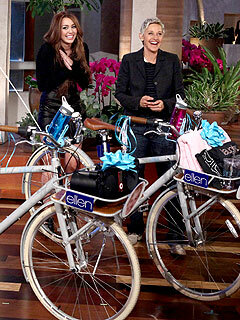 But Cyrus finally informed Hemsworth: “Okay, you’re going to be my boyfriend,” and it’s been a smooth ride ever since – so much so that DeGeneres presented the happy couple with a set of bikes.